Originally from York, PA, Greg Reese began playing professionally at age 16. After graduating from Towson University, and 2 years freelancing, he auditioned and won a position with the Jazz Ambassadors of the U.S. Army Field Band, the premiere touring jazz ensemble of the US Army. Greg retired from the military in 2000 after 20 years of worldwide touring and recording with the Jazz Ambassadors, and has continued his freelance career. 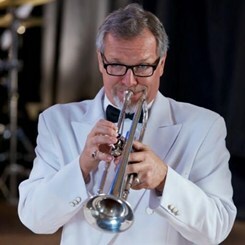 Greg has been teaching trumpet at Music & Arts at the Severna Park and Bowie locations for the past 14 years. Greg’s years of professional playing experience include thousands of public performances nationally and internationally, prestigious European Jazz Festivals: Montreux, North Sea, Nice, Spa, Vienne, Brussels, North American Jazz Festivals: Newport, Detroit, Elkhart, Toronto, and Montreal, sharing the stage with; Trumpeters: Arturo Sandoval, Al Vizutti, Marv Stamm, George Graham, Rick Braun, Mike Vax, Wayne Bergeron, Tom Williams, Chris Walker, Vaughn Nark, Bill Warfield, Paul Stephens, Joey Tartell, Alex Norris, Trombonists: Frank Rosolino, Bill Watrous, Wayne Andre, Jim McFalls, Doug Elliott, Dave Steinmeyer, John Jensen, Phil Wilson, Chris Buckholz, Warren Covington, George Roberts, Rich Matteson, Percussionists: Louis Bellson, Ndugu Chancler, Ed Shaughnessy, Sonny Emory, Butch Miles, Joe McCarthy, Frank Russo, Todd Harrison, Steve Fidyk, Dave Samuels, Chuck Redd, Alfredo Mojica, Roberto Quintero, Saxophonists: James Moody, Don Menza, Jamey Aebersold, Ben Kono, Bruce Swaim, John DeSalme, Jim Snidero, Ellery Eskelin, Chris Vadala, Vince Norman, Luis Hernandez, Gabe Baltazar, Richie Cole, Red Holloway, Bassists: Keter Betts, Drew Gress, Paul Gill, Tom Baldwin, Max Murray, Geoff Harper, Gary Grainger, Mike Pope, Vocalists: Ella Fitzgerald, Diane Reeves, Ethel Ennis, Steve Lippia, Jeremy Ragsdale, Sheila Ford, Shirley Alston Reeves, Lou Christie, The Tokens, The Vogues, the great jazz harmonica of “Toots”Thielmanns, composer and conductor Marvin Hamlisch, and performances with the Big Apple Circus, and the Baltimore, Detroit, and Cincinnati Symphonies.